The other day we managed to get home our annual hay bale, always a good day around here! We live in the country and on every field you can see a pile of these white silage bales looking much like a pile of UFO eggs. Each one weighs some 500 kilos, inside the tight plastic skin is a tightly-rolled bale of hay. The farmers make them directly on the field during the summer and use them for animal fodder in the winter, during the time they stand there the hay ferments which stops it rotting and makes it a good food source. Here in Sweden they’re white, I assume it’s a way of keeping them a bit cooler but also helps disguise them during the six months of white winter we have here. The thing is, many of these bales turn bad. The plastic fails, the rain gets in, they start to rot. Which means they have no value whatsover to the farmers as they can’t be used as fodder. But they are the best thing ever if you’re a gardener and can get hold of one! Just ask for the most rotten bale the farmer has on stock — and if he could give you a hand getting it onto your trailer with his tractor! Here at home we use a bale a year in our veggie garden and around the house when we’re starting up new garden beds or trying to restore some corner or other. It works just brilliantly in combination with Bokashi and the fermentation that the bale has been through means you don’t get any weed seeds out of the hay. Yesterday the rhubarb bed got a much-needed topup. We have a 5 meter wooden box with some 5 rhubarb plants. The soil has been sinking lower and lower and they haven’t had any real fertilising for some years. I started by spreading out a couple of buckets of Bokashi (would have used more but that was what I had on hand) and then topped it off with a 10 cm layer of hay from the silage bale. Embarrassingly quick and easy. No digging at all. On the other hand we’ve had a family of crows giving us a hard time this spring, picking through all our garden beds looking for lunch, so I’ll keep an eye on that. In worst case it’s just to throw over a berry net. The other problem with mulching, at least for us here, can be snails. I’ve had problems in this bed before so early this spring I removed all the winter mulch and have had the bed bare since then while the snail hunt was on. Think it’s fixed now, but I’ll lay out a handful of snail pellets (organic) to be sure. One of the reasons why it’s good to use Bokashi in combination with mulch like this is that it balances out the carbon-nitrogen balance. If you just lay out a lot of browns (like this silage) there’s a risk the mulch may steal nitrogen from the plants. But with a layer of Bokashi under the mulch there should be nitrogen enough for everyone. If you don’t have much Bokashi to put under you could always kickstart the nitrogen with Bokashi liquid, nestle water or some good old diluted urine. We’ve been doing this hay-bale thing for a few years now and I just love it. It’s such an easy way to top up a bed (like this one) or to get a new bed going. We’re too lazy to dig round here so when we’re starting off a new bed (whether for veggies or flowers) we just lay out some newspapers, spread out some Bokashi, dump a few buckets of coffee grinds (that we get from the local café) and cover the lot with silage. Smells like a bit of a farmyard for a few days but turns pretty quickly into the best soil. And if you have a long winter like ours it’s great to have a pile of old silage on stock to cover all the beds for the winter. Gives your worms a warmer place to be and keeps them working longer, and when you remove the layer in the spring (if you do) you’ll be surprised how little there is left. I know not everyone is surrounded by lakes and fields like we are, but for what it’s worth this is what we do. Maybe you have some other resource where you live that’s cheap and easy to get hold of and could do some good work on your veggie patch? Love to hear your ideas! 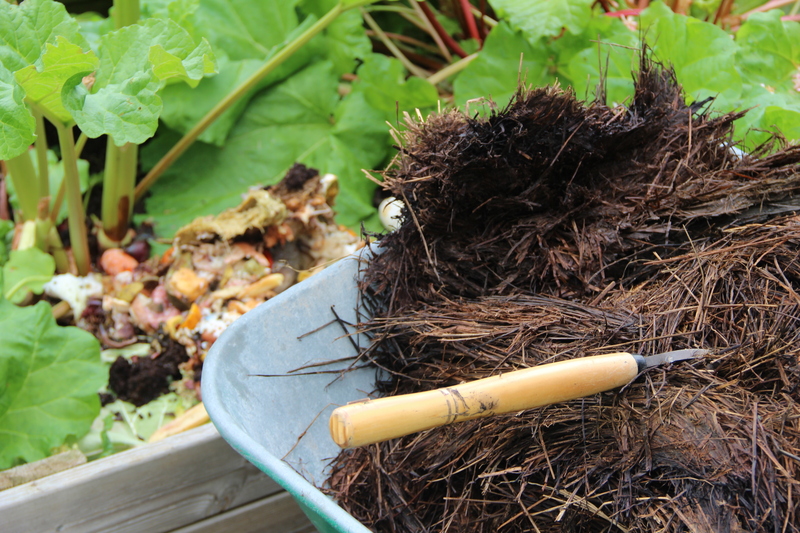 It’s great to see what you’re up to in Bokashi composting this time, Jenny! I have two questions for you: Is it ok to place the Bokashi fermented food so close to your plants? I thought it would be too acidic and may burn them? Also, don’t animals come to dig out the Bokashi through the silage? 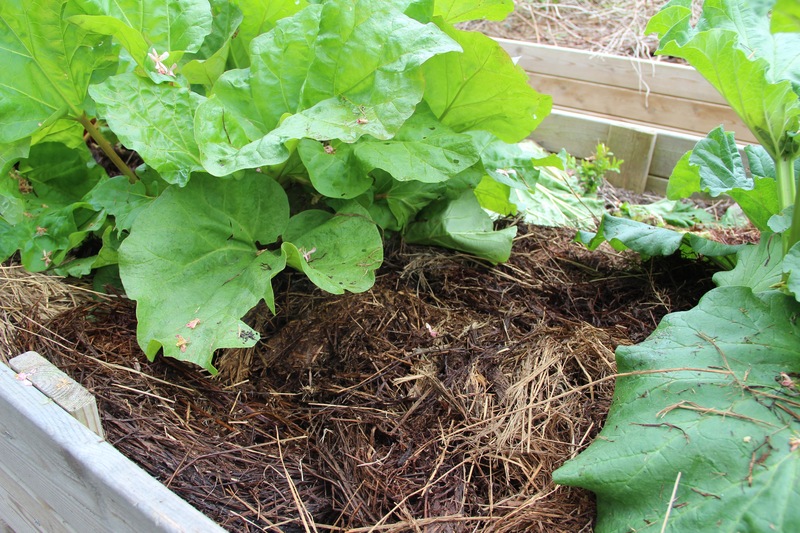 I use plenty of straw mulch myself, but didn’t think of using Bokashi underneath! Anyway, this reminds me of how I made my very first veggie garden. I was following the Food4Wealth method, which is like lasagna gardening. 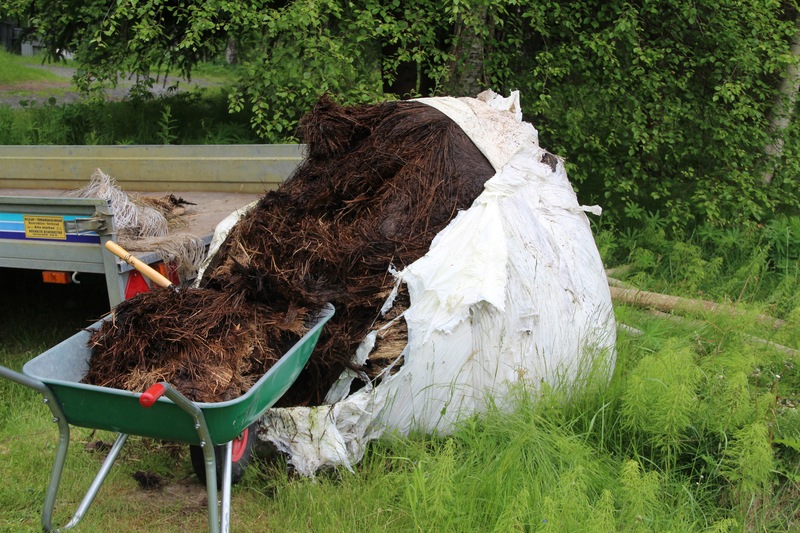 The garden bed is created with layers of newspapers, straw, compost, fertilizer, and more compost and straw. I decided, since I have all this Bokashi from last Winter, why not use them instead of all those layers? So I made my raised bed with newspapers, Bokashi fermented food (3 buckets worth), and then a mixture of compost (some from my Bokashi soil factory) and top soil. Then I crossed my fingers. I didn’t take pictures, because I thought it might fail! But I’m happy to report that I have cucumbers, peas, herbs, spring onions, carrots, and cherry tomatoes growing in that bed now. Will share photos soon. Meanwhile, I look forward to your posts, Jenny! Hi Alexis! Love the term “lasagne gardening”! That’s pretty much what we do too, just didn’t have a name for it. The less digging the better, and it’s amazing what fantastic resources are just lying around waiting to be turned into a garden. 1, acidity. I’m not worried about that, the pH is low for a couple of weeks then it becomes normal (7-ish) even if the Bokashi is still looking like food. I would assume the rhubarb roots (in this case) would be a fair bit deeper in the soil and the benefits will come when the nutrients soak down to them. I wouldn’t expect any direct contact really, and even if they did it would probably take a couple of weeks anyhow. 2, animals. Yes, well. The crows did find it and made a great mess flicking stuff all over. 5 minutes and it was cleaned up so no big deal really but I’ll be a bit more careful in future! It’s a bit trickier when you have plants already in the bed, if it was an unplanted area I would have just covered over the new mulch with something (black plastic, fiber cloth, an old mat) for a couple of weeks to keep the animals out. That’s not so silly anyhow as it increases the temperature a bit and speeds up the process. Your garden sounds like a great success!! Woohoo!! This is such a great idea! We live in the country too (Snowy Mountains of Australia), so there’s a lot of hay bales. I don’t know if they rot here over winter, but I’ll have to find out about it. We have two pet bunnies here, and we use hay for their bedding. Everytime we clean out the cage, we have great, compostable, mulchable hay, with rabbit poo and urine through it! Our garden LOVES it! I’m also finding that the more rabbit poo I put over the top of the mulch, the less weeds we get, so go figure! When I have enough rabbit manure, I try to aim for a good two inch top layer, and that seems to be my no weed secret. It’s great too, because although I compost the old fashioned way and am trying to get the hang of bokashi, rabbit poo is a very quick way for me to work through food scraps, and the kids love to pick grass for them, which helps a little bit to keep the lawn down. Hi Sharon! Sounds like you’re going to have such great soil there, you’ve got it made with bunny dung and all! Good luck with your garden, love to hear how you get on with it! What a great idea for use with Bokashi and for composting in general, I’ve seen the same thing around these parts – sharing on twitter! I’m affiliated with a new Bokashi company ad love how much fun we’re having in the soil now!